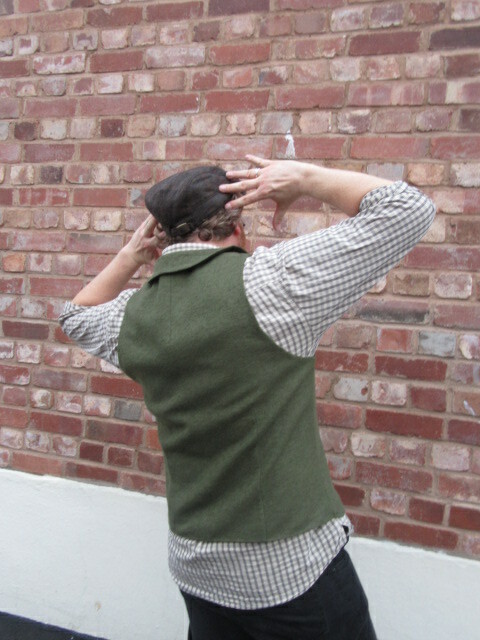 Oh, I just remembered, I can banish all thoughts of my ineptitude at woodwork by telling you all about the Man’s waistcoat which I finally finished! Finally managed a daylight photo shoot and it got photobombed! He was trying to look like a Victorian Head of the Household apparently (so I was instructed to take a sepia shot, but as it’s his camera I didn’t know how, so I used black and white). I nearly finished it before Christmas. 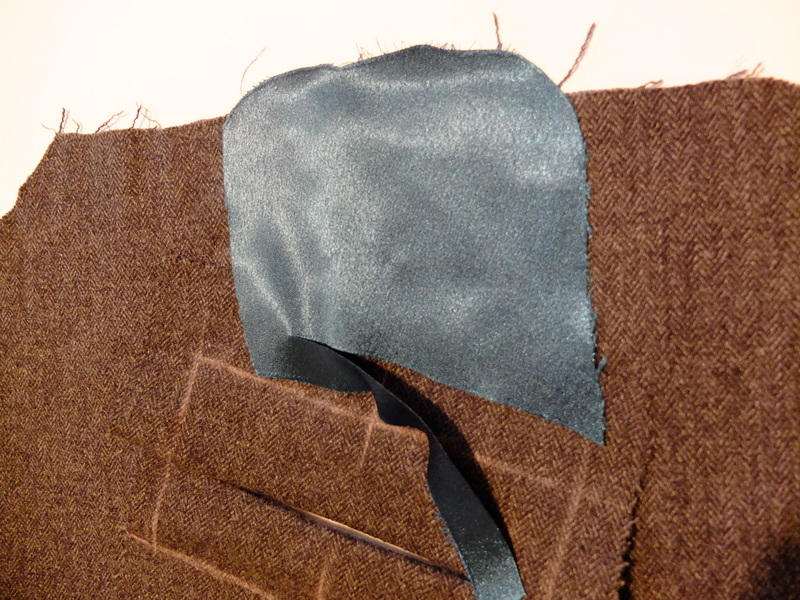 The welt pockets didn’t go too badly in the end, although they don’t look as good as my practice one. I had cut the pocket linings from the pattern, but then decided the decidedly simpler looking welt pocket tutorial on the Oliver and S blog was the way to go. Plus it doesn’t have a triangular flap of fabric that you have to fold under and handstitch into place (spot the potential shabby finish, handsewing is not my forte). However, they use a rectangle of lining fabric and I didn’t have much left. So I sort of bodged the two methods together, sewing the welt the Oliver and S way and then attaching the lining pieces to them and then sewing them up. It worked ok. 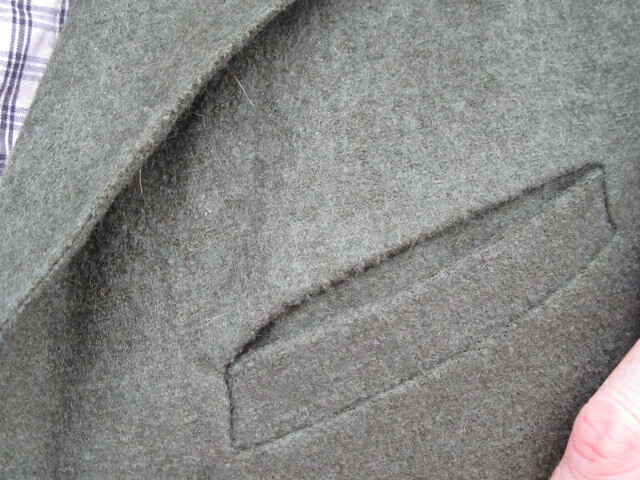 The top of the pocket on the inside is wool and then lower down it’s green lining. The slit is cut, the welt piece (currently looking rectangular) is on the inside and I’m figuring how and where to attach the lining pieces to it (hence chalk marks) before I can press and stitch the relevant folds that make it a welt into place and sew up my pocket bags. But after I attached the lining the collar was sitting wierdly, it had wibbles in it (can’t think of a better way to describe it). 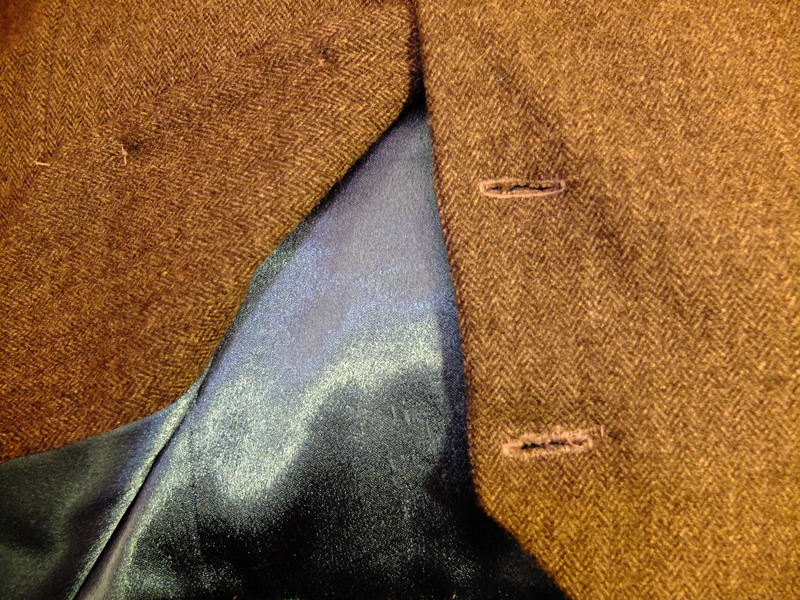 I’m fairly sure the lapels are attached to the back collar piece back to front, but I was loathe to unpick the collar from the lining and main waistcoat, and then unpick the collar from itself and restitch them. So I sulked. Then I tacked it into place and steamed it lots, left it a few days, steamed it lots, hubby wore it around the house, left it a few days, and repeat. Eventually I took the stitches out and it was better. Not right, but hubby was happy with it and I wasn’t confident it would look better after being attacked with a seam ripper. In the colour shot you can see how well it matches the shirt my mum bought him for Christmas as well as playing spot the still wibbly bits on the collar. Next stop, to get some buttons. 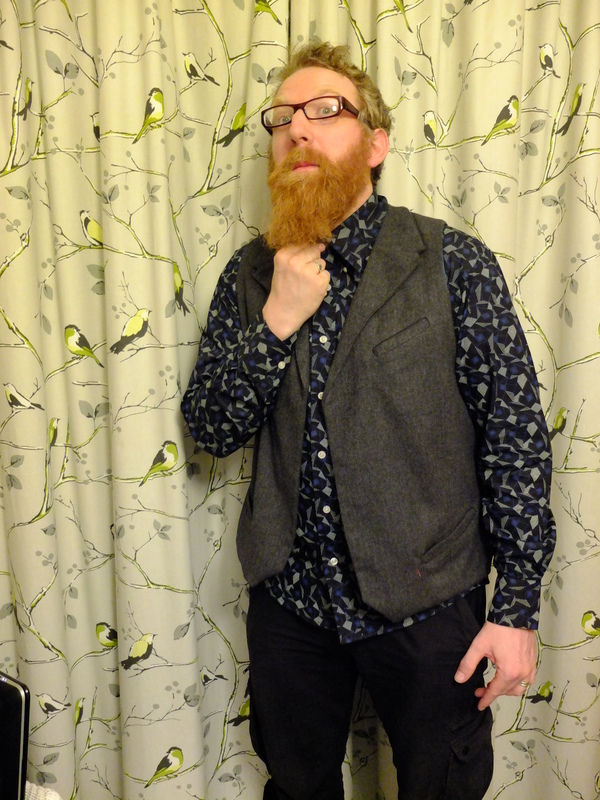 There was one with the waistcoat which I think hubby chose as a possible at the time (either that or I’ve lost the rest) but it was a bit small. They didn’t have any the same in the shop but I found something close that he approved of. And then I didn’t get around to making the buttonholes. In my defenes we had 2 lots of family staying back to back and I was really ill with flu and there were Anna dresses to sew etc. 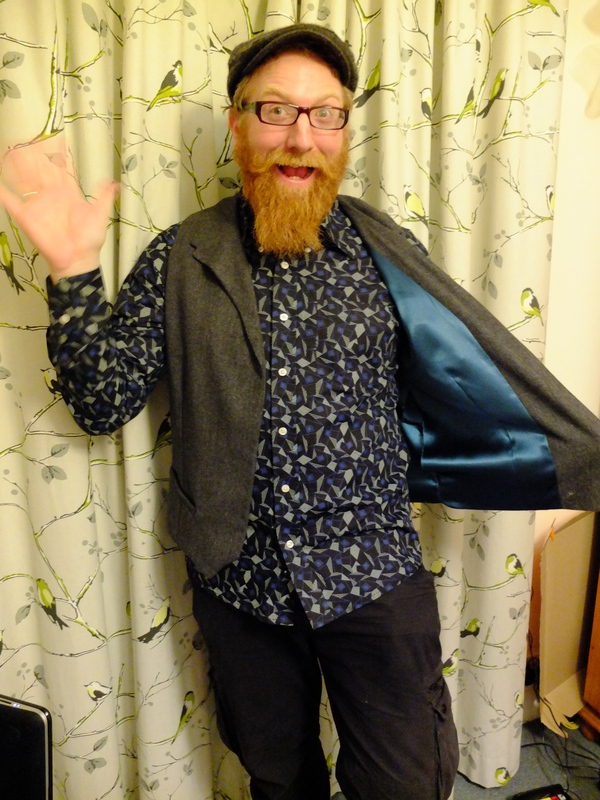 In the mean time, he wore it out to his Christmas night out, with no buttons. The Man decided to do Humourous Poses. 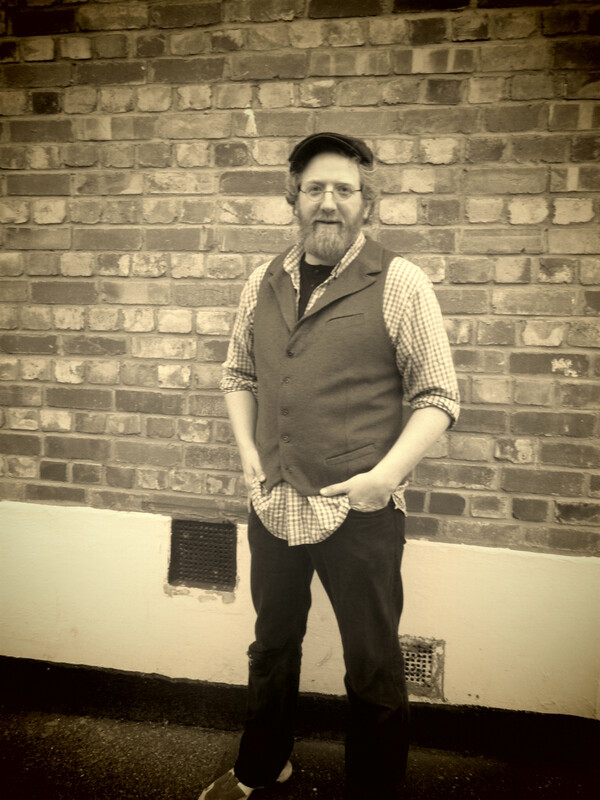 (He was about to go on his Works Night Out and was in a good mood – so all these photo’s are before the waistcoat was actually finished). 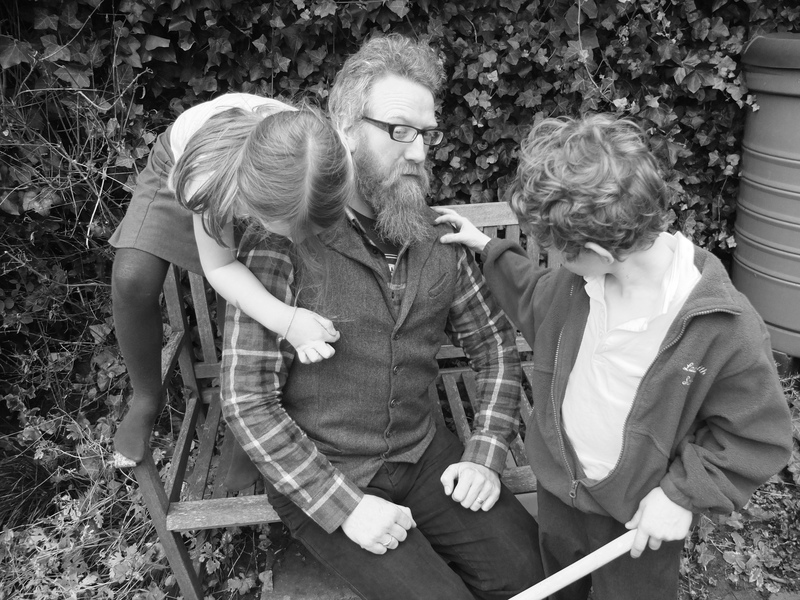 I think this is him doing up his top shirt button. After that it was Christmas and we were busy and he kept wearing it! It goes really nicely with the shirt my mum gave him for Christmas. 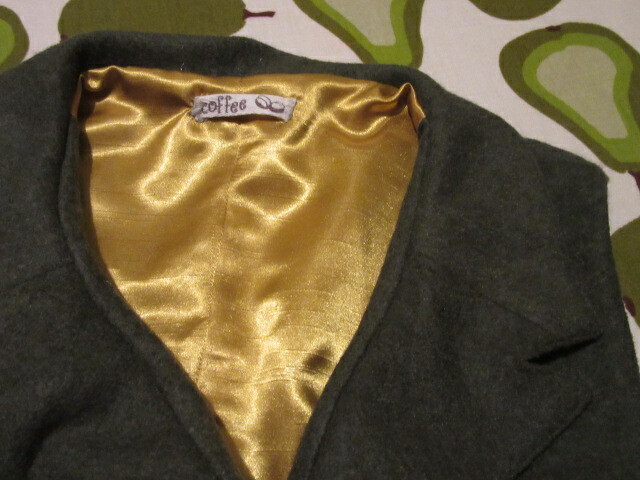 Eventually I added buttonholes, but the bottom one messed up badly so I didn’t cut it and he had 4 for a while. Again, I never got chance to sew it as it was being worn! 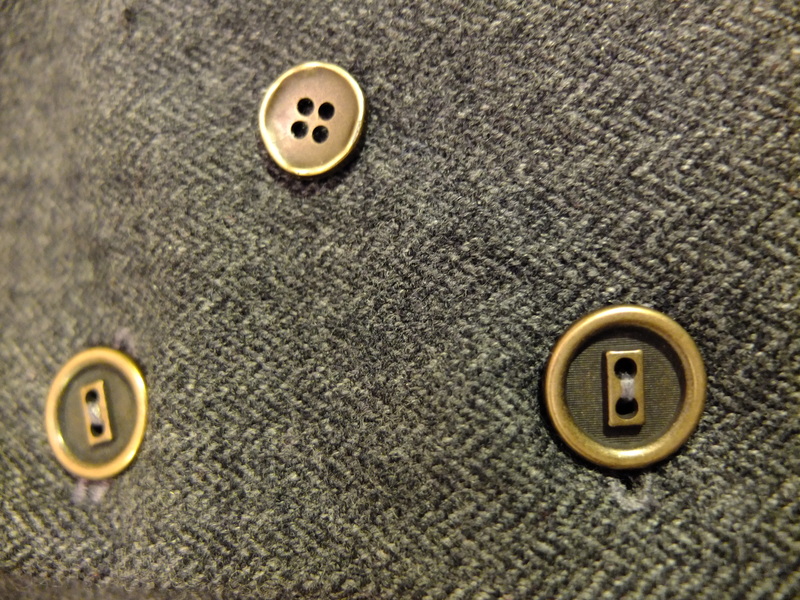 The bottom two buttonholes, that last one is a bit scruffy. Plus on the left you can see the lining attached to the self drafted facing. 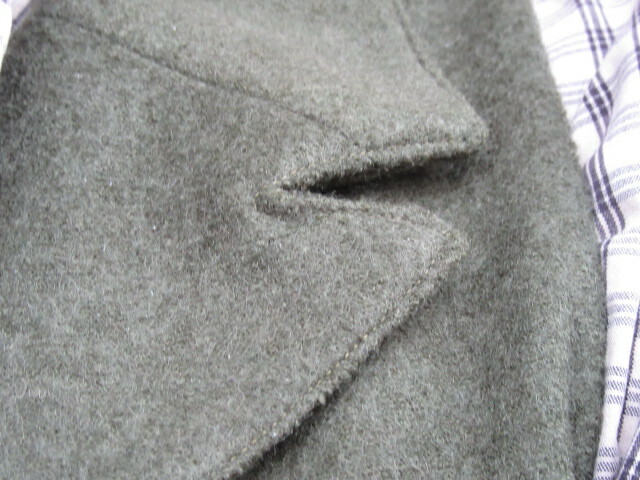 Finally, I unpicked the dodgy button hole and re did it. Badly. In the process I found a better colour grey thread I should have used for the others and then a third shade that I thought was the same as the others but is slightly different – I never knew I had so much grey thread! Also, for some unknown reason, I didn’t set the stitch length right, but didn’t work this out until after I’d cut the buttonhole. It was clearly going to unravel if I left it like that, so I hand stitched over my efforts with blanket stitch. It won’t win any prizes but it will hold. I think. Then I just needed to stitch up the lining seam where it was turned (more hand stitching, I must love him), sew the last button on and Finally it was done! Hoorah. It really obviously looks hand made to me. The collar is the worse bit, but the button holes aren’t great on close inspection and the lining at the back appears to be shorter than the main fabric so it bags out a bit. But I don’t think a non sewer would spot these things and he wears it all the time. 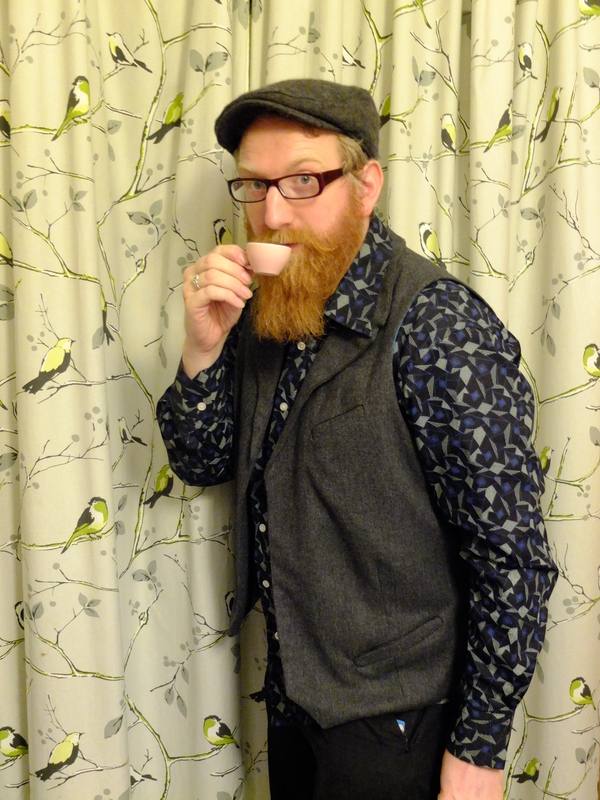 Drinking a dolls cup of tea (note waistcoat matches his shop bought hat). I’ve also bought fabric to make a second one as I figured after all that messing around with the pattern it would help me recoup my time outlay. He chose green boiled wool, lining as yet undecided. I’ll see if I can get the collar better next time. Lets hope this one doesn’t take to long as he’s mentioned a black one too! Lining Joy. It’s actually a really bright green, not blue at all, honest. Well, after taking some steps in the right direction, namely seriously denting my pile and making something for myself (which I haven’t blogged properly about yet for complicated reasons) have I capitilised on my success? No, of course not. I’ve started new projects. I have completed one. 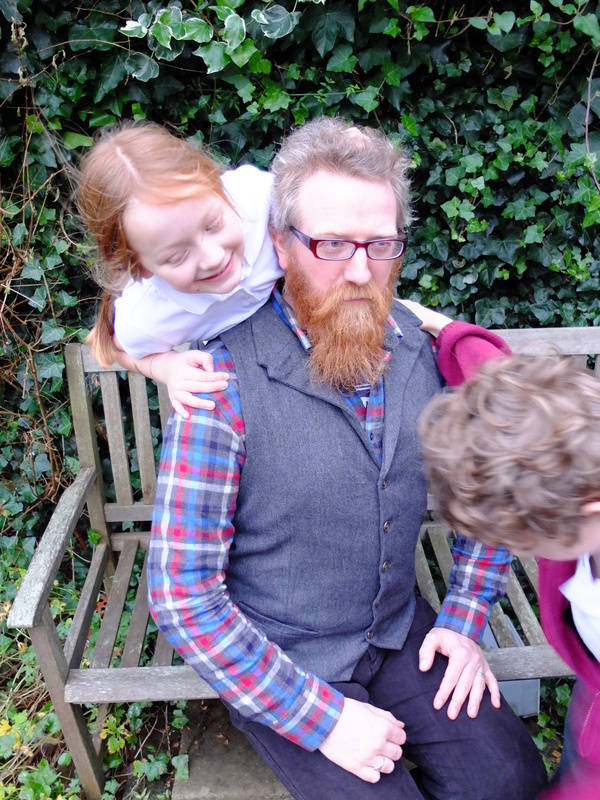 Another school pinafore. Little girl was sad that the first one was in the wash and she couldn’t wear it and I had enough fabric left so I made another. 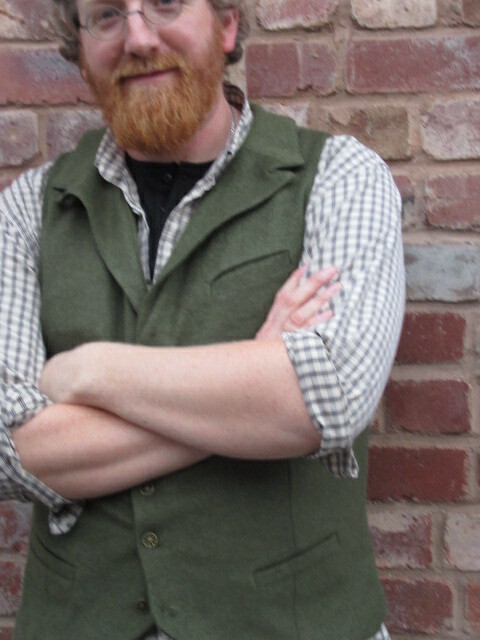 It looks just like the first, but with slightly different buttons, so I haven’t taken a photo. This time I finished the edges of the ruffles that get gathered as well as the edges that get hemmed, as one of my original ruffles had embarassingly started coming apart at the seam and needed mending. 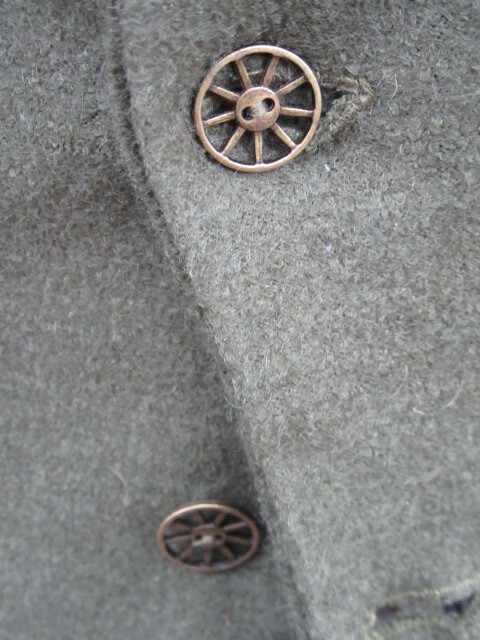 I also made sure they were well attatched to the yoke before adding the yoke facing. So far so good. Other than not using a different colour thread for the gathers this time (honestly, if you have to use contrast thread to tell it’s there so that you can take it out, why not use the same colour thread and any you can’t spot can safely be left in) the only other thing I did different was to cut the pocket bags in with the front and back. This was simpler to do and quicker to make up but takes more fabric, but I had enough. 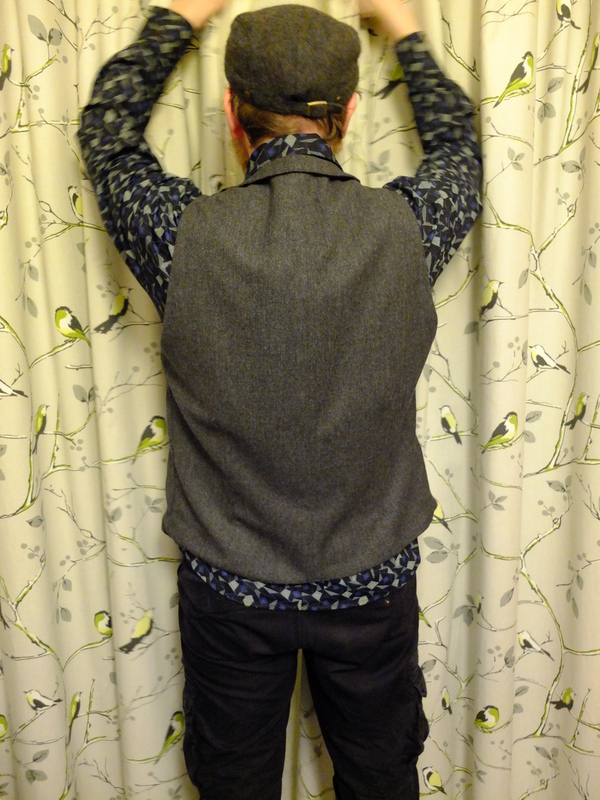 It was hard for me to make the same garment twice in a row in the same fabric. I was itching to change things. I did construct it in a slightly different order, just to keep me sane (nothing major). 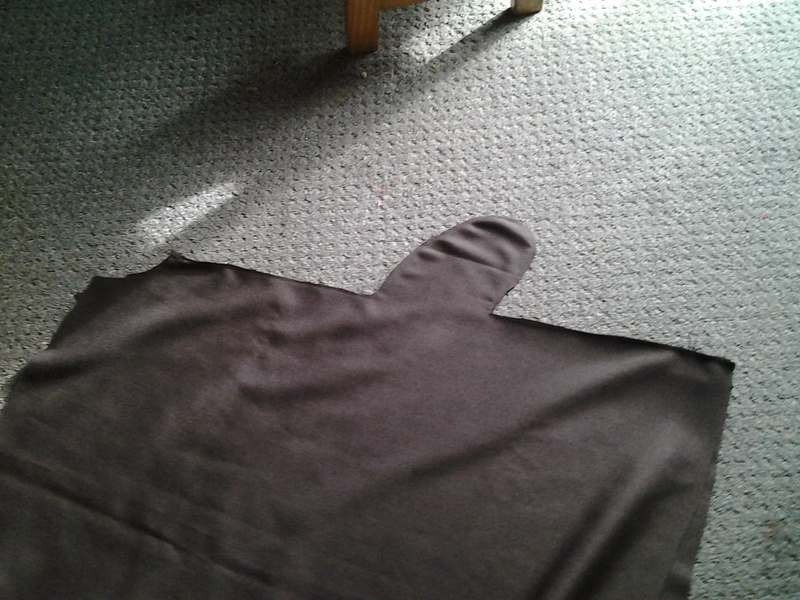 But it was a lot faster as I knew what I was doing and the pattern pieces were already traced. Then I bought some very special fabric to make up a slightly different sew chic dress as a party dress, fabric that only a nearly 6 year old girl could love. I’ve cut out the pieces but had to wait for a child free time to start it so it stays a surprise. This evening was my first chance but my husband was using the machine to make a rag coat. Oh well, I started cutting a shirt for my son instead. I think I’m going to try making the sew chic shirt ‘t’ which has a proper collar but try and mash it up with the long sleeve option of the simplicity pattern that I used to make his pirate t shirt. And if that isn’t complicated enough the fabric is a seersucker check (I was heckled with cries of tablecloth) that requires pattern matching and won’t lie flat due to it’s seersucker nature (no, I have neither pre washed nor ironed it either, I have reverted to type). 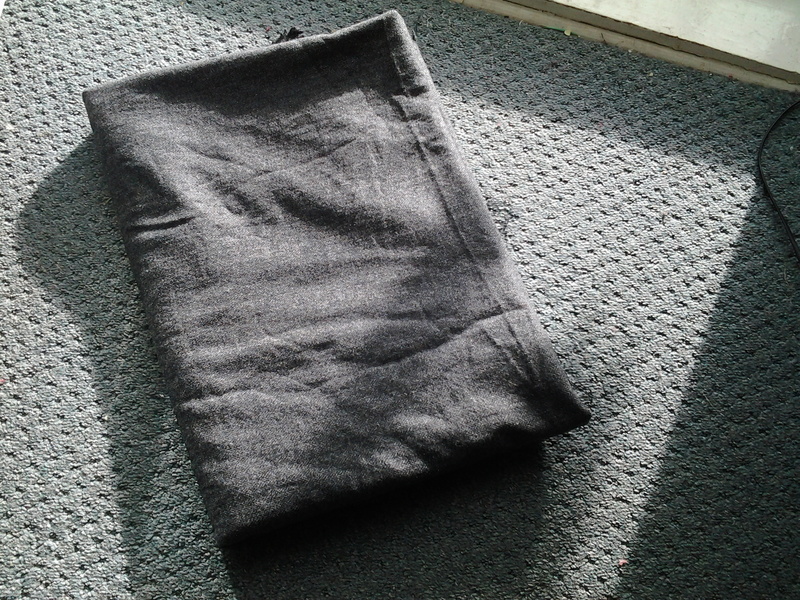 I have cut out the front, back and yoke and I’m going to construct them before cutting the sleeves. So I’m itching to get started on one or the other, but then I realised I only have the daytime this week and Thursday evening to make hubbies present while he isn’t around. The pattern is here now so I’ll try and get it tomorrow without accidently buying something else at the fabric shop and then I can do even more cutting out, eurghh. 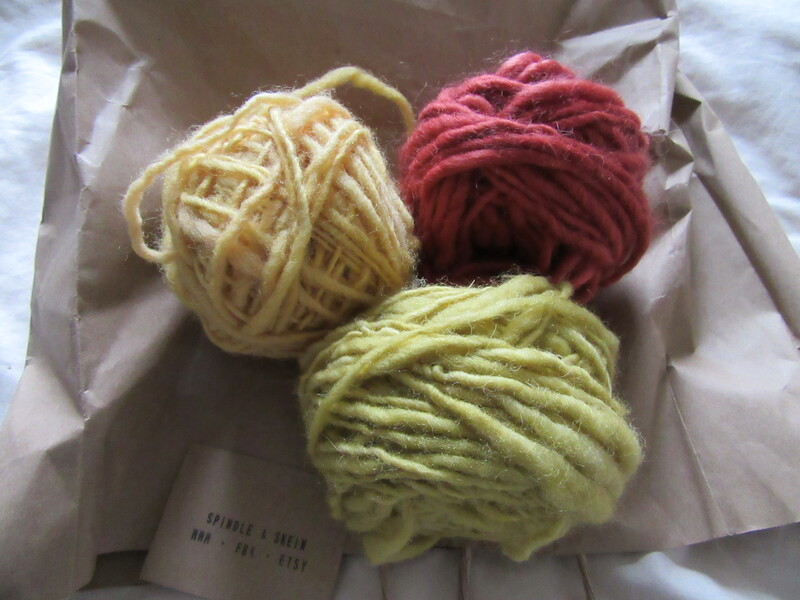 Remember the gorgeous but impossible to work with yarn that I bought? 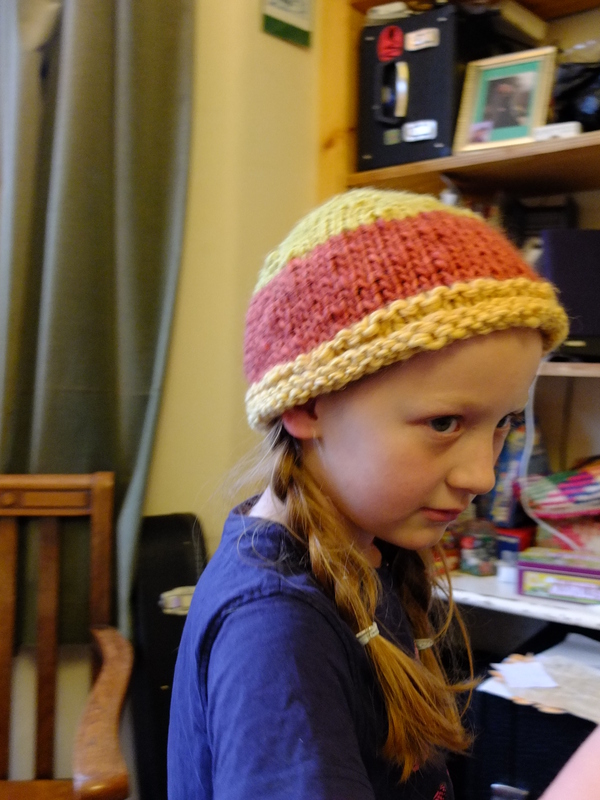 Well, I forgot to say that I knit it up. 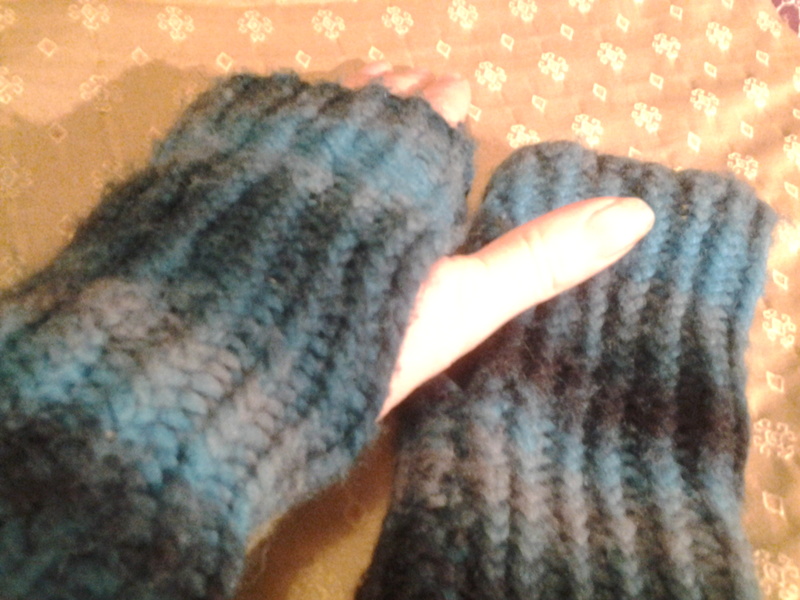 Here are my two rectangles before I sewed them up into fingerless mitten / wristwarmer thingies. 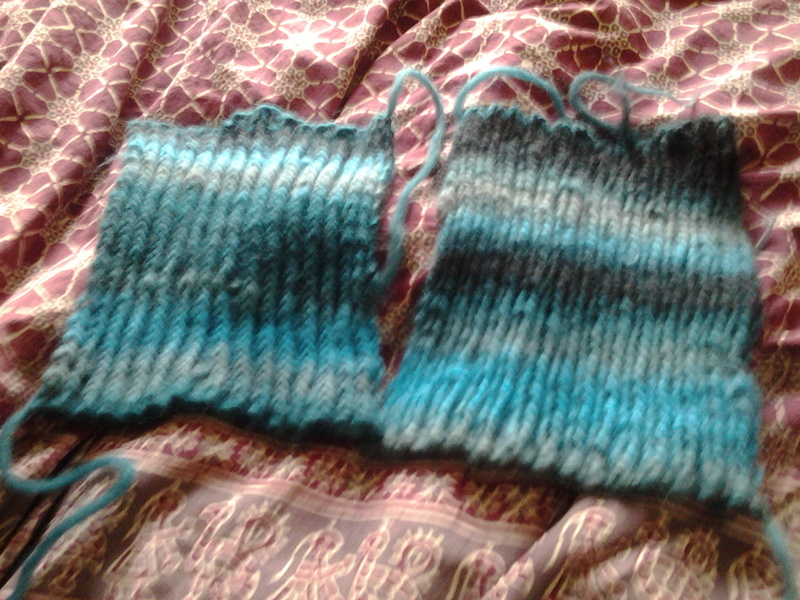 The left shows the front of the twisted rib, the right the back where it comes out as plain rib. (Apologise for the fuzzy photo, I’m having hardware issues). 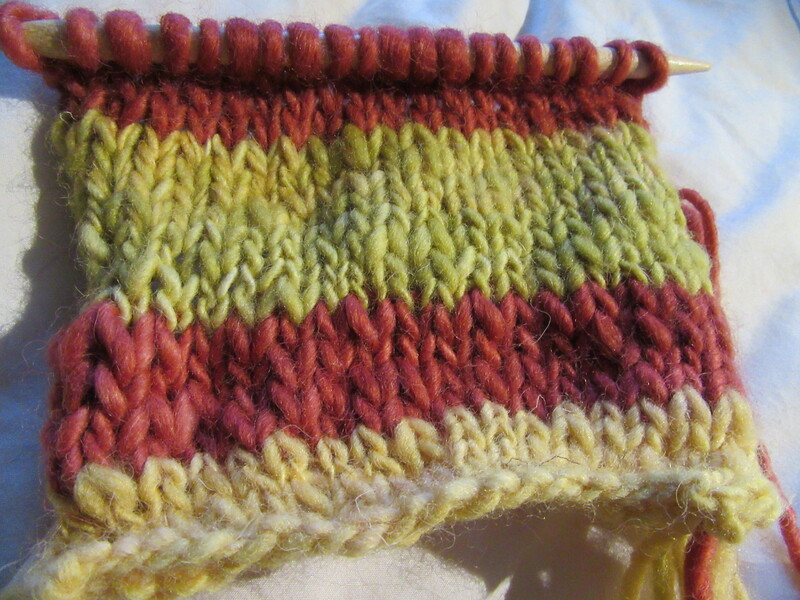 I didn’t want to do anything complicated texturewise that would fight with the variagated yarn, but I wanted something a bit more interesting than plain rib. I like the effect I got, but it’s messy. My excuse is the number of times I had to tie the yarn back in because it broke as I was knittng. 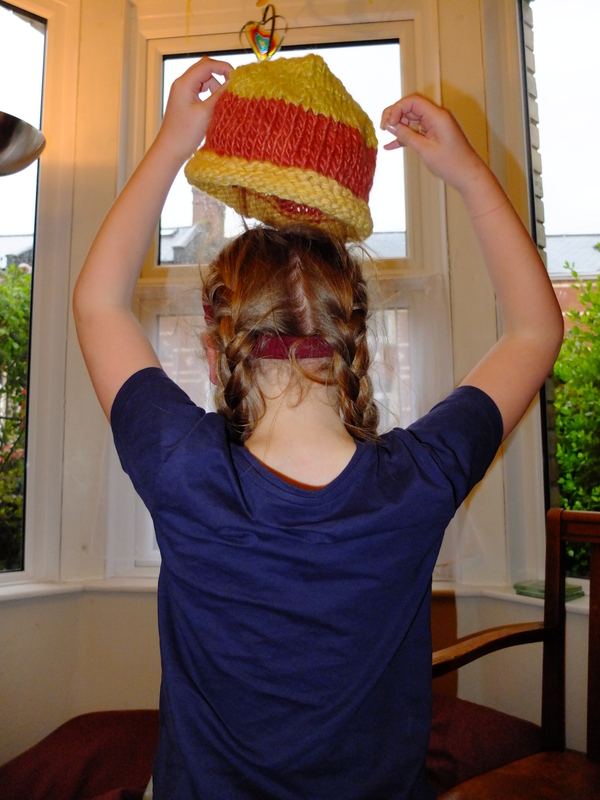 I knitted the ends in as I went because I couldn’t face the thought of weaving them all in. Well, they’re cosy and stay on and I still love the colours. Need to make the thumb holes a bit smaller though.